Jeffrey Court Metal Wall Tiles make a great complement to a wide variety of decorative styles and add a level of design sophistication to any room. Metal mosaic tiles are great by themselves or can be installed alongside stone or ceramic field tiles (sold separately) to create a coordinated look. Mesh-mounted glass mosaic tiles are easier to install than traditional tile formats and can be used as whole sheets or cut to make inexpensive feature strips. Recommended for kitchen backsplashes, accent walls and vanities. Best when installed with white polymer-modified thinset and either sanded or non-sanded grout for best installation results. 1 square feet, 8 pieces per pack. Pack weight is 2.9 lbs. 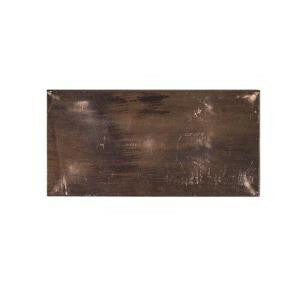 Buy online Jeffrey Court Copper Field 3 in. x 6 in. x 8 mm Metal Wall Tile (8-Pieces/Pack) 99286, leave review and share Your friends.